A senior official tells Arutz Sheva he agrees with Leah Goldin, who attacked the government at hearing on Operation Protective Edge. 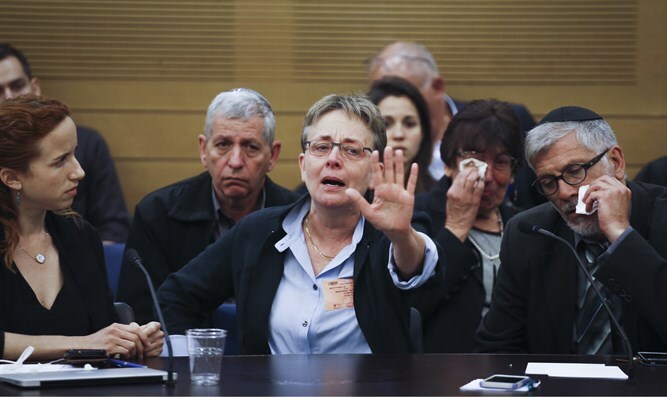 A day after the heated discussion in the Knesset State Control Committee on Wednesday, a senior government official spoke with Arutz Sheva about the harsh words of Leah Goldin, mother of soldier Hadar Goldin, whose body is being held by Hamas. “The Goldin family is a wonderful family that strongly opposes freeing terrorists in order to get the body of their son back for burial in Israel. The family is not ready for Israel to release terrorists in order to apply pressure on Hamas,” the official said. Yesterday at the State Control Committee hearing on Operation Protective Edge, Dr. Leah Goldin criticized State Comptroller Yosef Shapira and hurled words of pain at him: "The comptroller's report forgot or made sure to forget, two outstanding soldiers: my son Hadar Goldin and Oron Shaul, who were kidnapped into the tunnels. It was important for the comptroller to emphasize that a foreign worker was killed. But the two prisoners in Gaza were not mentioned. You can not call Hadar and Oron corpses, they are not corpses, they are missing." "Have you already decided that their fate was sealed? How could you finish the operation when they were still there? Are we, the bereaved parents, a mere pathological report to you? Today, almost three years after the war, none of the cabinet's decisions have been implemented ... The committee on the prisoners does not meet ... I know how the report on the next war will look". Hadar's mother called out to the Prime Minister: "For three years we have been hearing 'I am a bereaved brother' - your brother has been returned. Please do not intimidate us. You have turned us into the enemies of the people." "Hamas wanted to kidnap and today they have two soldiers, and the question of whether you will succeed in bringing them back without taking the country down into miserable grief will determine the outcome of Operation Protective Edge," she said. Prime Minister Binyamin Netanyahu said during the discussion, "We are doing everything we can to bring Oron and Hadar back, but there are risks that I am not prepared to take."